Abraham Butler Tipton family Bible, 1821. Portion of one of several handwritten pages in A. B. Tipton family Bible. Sullivan County Manuscript Collection 0075. It should be noted that due to the fragility of this Bible, the original Bible is retired from handling and researchers are asked to refer to facsimilies of the handwritten pages. There are no other restrictions on use of this manuscript collection for research purposes. It is the responsibility of the individual user to ascertain copyright restrictions, obtain permissions and to prepare proper citation and credit statements. The researcher assumes all legal responsibility for observing laws of copyright and common law literary rights. Abraham Butler Tipton family Bible, 1821. MSS 0075, Archives and History Division, Sullivan County Department of Archives and Tourism, Blountville, Tennessee. 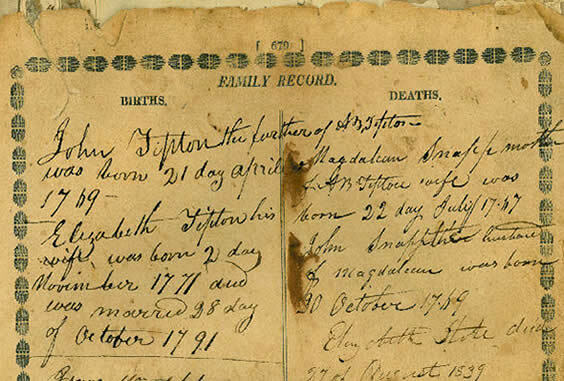 The Abraham Butler Tipton family Bible is of great significance for those researching Col. John Tipton (1730-1813) of East Tennessee and his descendants. The Bible was initially owned by Abraham B. Tipton (1794-1865) and his wife Margaret Snapp (1793-1886). The main title page and copyright page are missing from the Bible; however, the New Testament section has its own title and copyright page dated 1821. Handwritten pages chronicle the genealogy primarily of the Tipton family, and contains some genealogy of the Snapp and Carmack families. The Bible also contains an 1823 transcription by Margaret Tipton of one paragraph copied from a letter written by Thomas Jefferson to John Tipton II upon hearing about the death of John's father Col. John Tipton who died in 1813. [Thomas Jefferson had served as U.S. President from 1801-1809.] The binding for this oversized family Bible has come apart and is in very poor condition; however, the handwritten pages are highly legible at the time of processing. Abraham Butler Tipton (1794-1865) was the son of John Tipton and Elizabeth Snapp, and the grandson of Col. John Tipton (1730-1813).